All too often, valuable results from research reports receive an initial burst of publicity before being shelved and then largely forgotten. But one project has been keeping its research in the public eye by taking its findings onto the streets. A three-year study led by researchers at the University of York’s Centre for Housing Policy has been investigating the links between mobility and well-being among older people. The “Co-motion” project has been working with older people in York, Leeds and Hexham to explore how changes in their lives, such as losing sight, becoming a carer and starting to use a mobility scooter, have affected their mobility. One innovative strand of the project involved a six-month collaboration between the researchers and the award-winning poet, Anna Woodford. Anna has written a series of poems that reflect on the travel challenges of older and disabled people. In keeping with the spirit of the Co-Motion project, the poems have themselves become mobile. 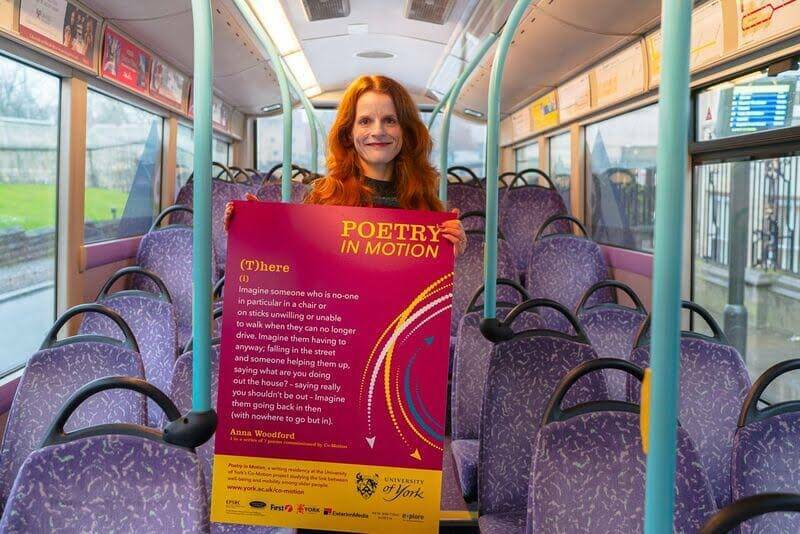 Earlier this year, buses serving passengers in and around the city of York began displaying Anna’s poems. The Co-Motion project leader, Dr Mark Bevan, from the Centre for Housing Policy, explained that one of the key messages emerging from the research was the need to raise awareness among service providers and the wider public about the diverse travel needs of people later in life. The Co-Motion project is one of seven Design for Well-being projects looking at ageing and mobility in the built environment, funded by the Engineering and Physical Sciences Research Council (EPSRC), the Economic and Social Research Council (ESRC) and the Arts and Humanities Research Council (AHRC). There are now plans for an exhibition of the Co-Motion poems at York Explore library and at Newcastle City library in autumn 2017, and it’s also hoped that the project will expand to look at people living with mental health issues. 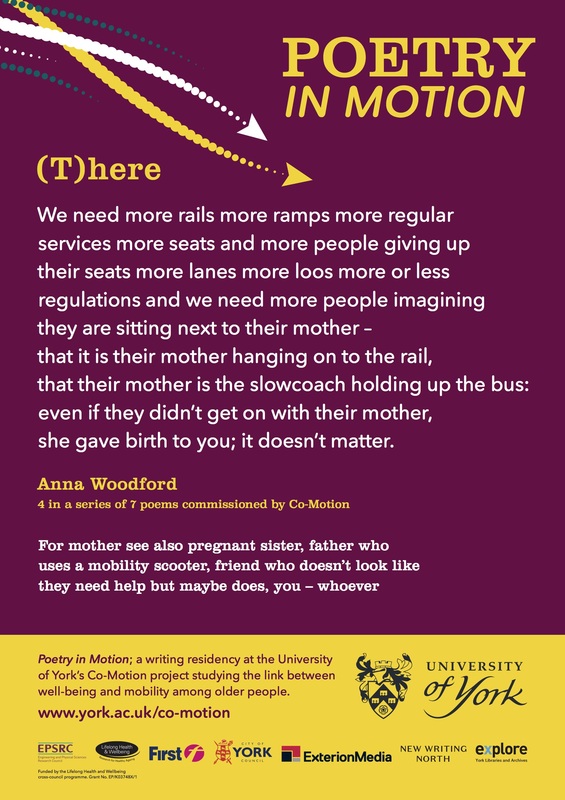 Poetry in Motion is in keeping with a strong tradition of the arts and public transport working hand-in-hand. For over thirty years, passengers on the London Underground have been able to enjoy a range of poems showcased in Tube train carriages across London. The success of the programme has inspired similar initiatives across the world. Meanwhile, in China, a London-based artist has taken the art and transport theme even further. Mira Calix created a moving museum on a bus, enabling passengers to take in sonic and visual art installations as part of their journey. And in New York City, photographs by the American artist Andres Serrano have appeared in subway stations to highlight the existence of homeless people on the streets. Although Andres doesn’t see himself as a crusader, he hopes that his images will make people stop and think. Public art can be appreciated on different levels – for its own sake, and to provoke reflections about its deeper meanings. The work of Anna Woodford, Andres Serrano and many other artists enables the travelling public to look with new eyes on the challenges facing vulnerable people, such as the elderly, the disabled and the homeless. A poem or a photograph, a painting or a story might not change the world, or even an individual. But if it causes people to pay attention, and to reflect on how it makes them feel, the artwork will have done its job. Follow us on Twitter to see what developments in transport, mobility, the arts and wellbeing are interesting our research team.